At the same time Doug and Sheila Carrick were building their retirement home on a waterfront lot on Hornby Island 21 years ago, a pair of bald eagles was building their nest 120 feet up in a tall Douglas fir tree right next door. It didn’t take the Carricks long to notice that the avian couple was engaged in work that paralleled theirs, and to get curious about them. But they had no idea how these birds would take front and centre in their lives, and how that curiosity would propel them into an adventure that would put them on the leading edge of Internet innovation. No one could have predicted a journey that began with something as simple as bird watching and ended up as an unprecedented mélange of high-tech communications, environmentalism, and international media attention. The Carricks are the unassuming citizens at the heart of the Hornby Eagle Webcam, an Internet project that went viral big time in 2006 when it first was launched. 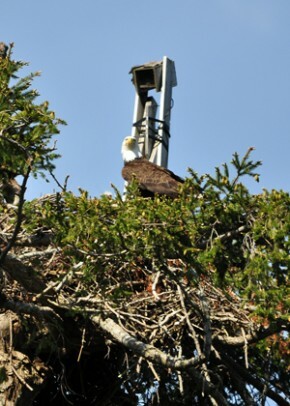 The live feed of the webcam, which broadcasts a close-up view of the eagles’ nest, was at one time the most viewed site on the web. Since then, hundreds of nature-observation web-cams have sprung up, many no doubt inspired by the Hornby one, which is still going strong. The Carricks’ house, on Hornby’s Grassy Point, is a light-filled, graceful space with huge windows on the north side facing the beach, which is where the eagles hunt. Along the opposite southern wall are desks with four different screens. Two show the eagles from different angles, one displays the ongoing discussion on the Eagles of Hornby Internet forum, and the fourth he uses to show me photos of the birds. The relationship between the northern wall and the southern wall is quite dynamic. When Carrick, watching the screen, sees an eagle take off from the nest, he turns around to watch for it flying over beach. When he sees the eagles on the beach, he updates the Forum with news of their antics and their interactions with the other creatures that live there. “For instance, they’ve been chasing goslings on the beach. I count the goslings every day, and there are still the original number—six,” he says. He reports on what the eagles are hunting and eating, their feeding frenzy during the annual herring spawn, and their conflicts with crows as they squabble over midshipmen, a tide pool fish that is a welcome source of summer food for both these species. Back at the northern wall, he shows me the coaxial cable that feeds into his computer from the camera. Then he takes me outside and shows me how it is strung up the Hydro pole, alongside the Hydro lines, and up to the tree. “It’s all quite amazing,” he says, enthusiastically. Although he’s probably done so hundreds of times, Carrick is happy to tell the tale of how all this happened. “It started with my own curiosity. I got more and more involved in observing the eagles,” he recounts. He began learning about other eagles and eagle nests on the Island, and educating himself about eagle lifecycles, including mating, nest-building, care of young, migration, and their relationship with other species. As curiosity often does when it is fed, his deepened. He assumed there were eggs in the nest—and he wanted to see them! But putting a video camera in a tree is no easy feat. Carrick enlisted the willing help of a friend from Victoria, a retired electronic systems engineer who had previously installed video cameras focused on eagles (and an underwater one to capture spawning salmon) at the Goldstream River. The next step was to get permission from the Ministry of Environment, which doesn’t let people meddle with eagle trees without good reason. He convinced them he was going to write a book, which fulfilled their criteria for “educational purposes,” and he got the permit. Next, he had to build a box to protect the camera from the weather. It had to keep the rain out but let air in, to avoid rot. And then he had to find someone to climb up the tree with the camera, and someone to string the cable up. The eagle tree is almost 18 feet around at its base, which makes it almost impossible to climb. Jed Young, the climber, had to go up a smaller tree nearby for the first 50 feet, and then swing across to the eagle tree for the remaining climb to the nest. Carrick calls September 27, 2004, Eagle Cam Day. That afternoon, the Carricks sat in the living room with friends, finally watching close-up live action of the eagle nest they’d been peering up at for 15 years. “For us, it was like watching the first man on the moon,” Carrick says. The eagles weren’t entirely oblivious to all this. The Plexiglas cover of the camera box showed them their reflections. Carrick watched as the eagles first spotted this. “They stared at it and glared at it as only eagles can do. One of them stepped closer, pecked around the edges of the camera, and then pushed its beak into the centre of the lens. As the eagle stepped forward, it became larger and larger until it looked like a giant staring out of the TV into our room,” recounts Carrick in the book he did indeed write, called The Eagles of Hornby Island. The eagles soon learned to ignore the odd-looking box, but Carrick remained fascinated. Several weeks later the Carricks were hosting Hancock and a computer-savvy friend, who set up a system that sends the video signals to a server in Los Angeles which transmits them out onto the Internet. The team had decided not to publicize the website for the first month or so, to give them time to work out the glitches. But one or two people found it, started blogging about it, and things took off. “On the first day there were 15 people discussing the eagles on a blog. By the fifth day there were several hundred,” says Carrick. By the time the webcam address was officially made public, it was getting a million hits per day. A few days later there were four million hits. Carrick says there were more people watching the eagles than were watching the Pope’s inauguration. And then the mainstream media caught on, and starting bombarding the Carricks with phone calls and emails from early morning till late at night. He recalls a reporter from the London Times waking him up at 5:00 am for an interview! It was exciting—but all a bit much. Especially when the Eaglecam server started putting ads up on the site, creating a furor and accusations of “commercialism”. At one point Carrick considered pulling the plug, but he didn’t—he could see how much of an impact the eagles were having on their viewers, and that gave him renewed energy. And soon, Carrick’s on-the-ground drama was overshadowed by the drama going on in the seven-foot wide nest: the two eggs that millions of people had been watching, that two eagle parents, oblivious to their fame, had been carefully tending, sitting on, turning every 20 minutes, and padding with dry grass for protection, ought to be hatching. But when the 35-day incubation period benchmark came, there were no signs of action. The world watched and waited and hoped on-line, but the eggs never hatched. This is not unusual in the eagle world, but it had never before been witnessed in real time by millions of humans. A woman in England recounted how she had spent the last month with her dying father, brought closer together by watching the eagles, who had reflected the deep bonds of family and the reality of dealing with death. A teacher of a special needs class wrote that watching the eagles brought her students closer together and helped them express emotion. Others wrote about the sense of connectedness they felt with the millions of people all over the world watching the eagles. “In a world struggling with monumental, disastrous issues, these two living creatures have shown us a commitment to life that is breathtaking,” wrote one person. In the following years, the webcam’s many viewers got to see a number of eggs hatch successfully. They watched the parents tend their young, and saw the hatchlings grow up till they were ready to leave the nest. This is the heart of the project, but other interesting developments have taken place. Carrick wrote his book, which was published in 2008 by Hancock House Publishers. The on-line forum has continued to be widely used and serves as a great educational tool, with people writing in their questions about eagles and eagle-experts sharing their knowledge. An organization called the Hornby Eagle Group and Partners has developed to support the project and protect the Hornby environment, which provides such wonderful eagle habitat. Carrick plans to write another book, this one not about eagles but about vultures, hawks, salmon and other coastal species, all of whom are integral to the eagles’ survival. “One thing I learned from studying eagles is that they are entirely dependent on the whole ecosystem. You can’t understand eagles without understanding everything. If the salmon are scarce, the eagles suffer. If the herring are scarce, the salmon suffer. “The eagles are great teachers, and what they’ve taught me most is the interrelatedness of all things,” he says. The Hornby Island eagles, as the pair is known, are getting old. They are 28, which is an usually advanced age to still be producing young. The Carricks, and the millions of Hornby eagle followers all over the globe, learned early on that death is part of the lifecycle. They will keep watching, inspired by their connection to the eagles’ lives, to each other, and to their own deep love of nature. Thank you for this article!! I have been watching the Hornby sight since last year. I knew very little about eagles at that point and was captivated and fascinated by what I saw. It started with watching little Phoenix who was just a couple of days old at the time and I became hooked immediately. Phoenix still remains in my heart and always will but it has been just as wonderful to watch Alexandra & David. I thank the Carricks for the opportunity to have had and still have this wonderful experience and to have also made the connection with so many fantastic people who care about wildlife & the environment. Blessings to all!!! I have been watching the eagles since I first heard about them, just before Phoenix was born. I laughed at their antics and cried for days when young Phoenix died. My grandkids come over and we check in with the webcam all the time. It’s wonderful to be able to share something so precious with my precious young ones. Thank you for all you’ve done for them – and the environment. The knowledge you have given the world is immeasureable. God bless you. 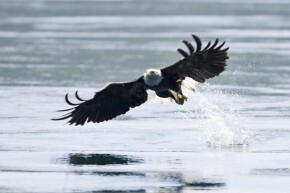 I, too, have been watching the Hornby Island eagles since last year when Phoenix appeared on the scene. I was fascinated watching the story of eagle life play out. I told friends about it, and they, too, became fixated on the daily drama. We were all so sad and grieved when Phoenix passed away, and I still carry that loss with me. This year, watching Alexandra and David, and the wonderful interaction between the parents and their eaglets has been heart warming, so educational as I read the questions and answers posted on the Chat space. I so admire what the Carricks are doing and am so grateful for the education and environmental awareness they are bringing to a world wide audience. There are no accidents in the Universe, and I believe you were brought to Hornby Island for the purpose of drawing the world together and to instill a greater appreciation for the circle of life as demonstrated through these wonderful birds. Thanks again. I too am a new watcher. I have been watching sinceust before Alexandra and David were born. It is one of the most wonderful sights . Doug and Sheila are great parents too . They make sure the eaglets get food and leave fish heads out for them if needed . What a wonderful world they have made for all of us to watch ! I live in Brazil and more than one year Hornby watch daily. It is wonderful to see these beautiful eagles and learn from people who are in the Forum, always very thoughtful. What an amazing experience Doug and Sheila Carrick have provided the world to see. I started watching the live cam in early April just after the eggs were laid. I learned of this website from my local KOMO news station in Seattle during an evening newscast. I was instantly hooked and drawn into the lives of this wonderful Hornby eagle family. I joined the chat room and the forum, learning more than I ever thought possible on a daily basis. I have since gone to Hornby Island along with some others by invitation to meet Mr. Carrick and see these and the other eagles of Hornby Island. I am so thankful to the Carrick’s and all the other wonderful, caring people I have met along the way. Learning about the eagles and the ecosystem, and how our environment affects them, has re-newed my soul. I have since slowed down enough to teach others I know some simple things to make our planet a better place to live, for all living things. I’ve always loved birds and especially raptors, but Bald Eagles have a special significance to me. I watch this site and quite a few others, but Hornby was my first and is still my favorite. The DVD is magnificent, and so is Doug’s book. I await his next one!! Thank you, Doug!! I spent 10 days on Hornby Island last year and loved every minute of it. Our rental was close to Grassy Point and were able to see both eagles in their nest every day. I was so pleased to learn I could continue to view the nest and all the eagle adventures from my home in Wisconsin. Thanks Doug & Sheila!